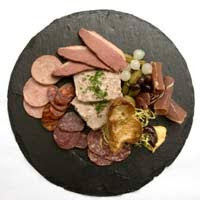 Charcuterie has its roots in the ancient world as a way to preserve meat before refrigeration. Today we honor this tradition partly as a way to uphold our culinary legacy, but mostly for reasons of taste. Charcuterie in its many forms — prosciutto, bacon, pâté, terrines, confit and sausage, to name a few — is a real treat and increasingly, one that can be found on Richmond menus. Read more in Style Weekly.